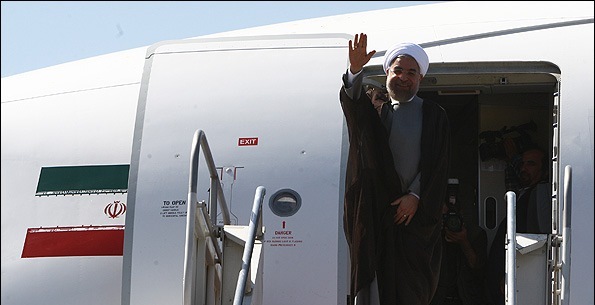 IRNA – Iranian President Hassan Rouhani left here for New York Sunday morning to participate in the 72nd session of the United Nations General Assembly. According to a report by the Presidential Office’s media department, President Rouhani has an intensive agenda during his visit to New York which includes an address to the General Assembly meeting to outline Tehran’s latest positions on different regional and international issues, particularly the tragic situation of Muslims in Myanmar. The President had also raised the issue of Muslims in Myanmar during his speech last week at a meeting of the Organization of the Islamic Cooperation (OIC) in Kazakhstan. While in New York, the Iranian president is to meet Iranian expatriates in the US as well as American political, cultural and Muslim elites. He will also hold talks with the heads of the US foreign policy think thanks and scholars as well as the senior officials of international media, meet with the UN Secretary General Antonio Guterres and hold separate meetings with a number of heads of states from other participating countries.